The collections include locomotives used by British Railways and by Scottish industry, and cover the period from 1940 to the present day. The early industrial electric and diesel types well represent the early developments in modern traction. In 1955, British Railways launched a modernisation plan, intended to re-equip and develop the railway system as it then existed, and which included the intention to gradually replace steam locomotives with diesel and electric traction. In respect of diesel locomotives, the Plan envisaged a range of locomotives of various power outputs to suit differing duties. A pilot scheme was put in hand immediately, to build 171 diesel locomotives of fourteen different types, for trial use. However, in mid 1956 a deteriorating financial situation led to a decision to proceed to order all locomotives that would enable the complete elimination of steam traction as quickly as possible. Not all the designs thus built were successful, and for example the North British Locomotive Company in Glasgow were locked in to building locomotives which were operationally unsatisfactory, a large factor contributing to the closure of the company in 1962. The collection includes only one electric locomotive, a shunting design from Fairfield's shipyard in Govan, Glasgow. 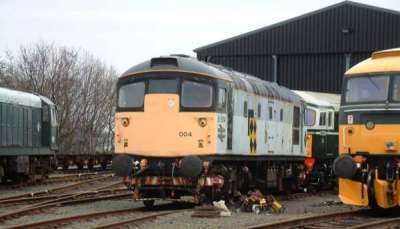 For the latest information about ongoing work on our diesel fleet (and how you can help), see the SRPS Diesel Group website.